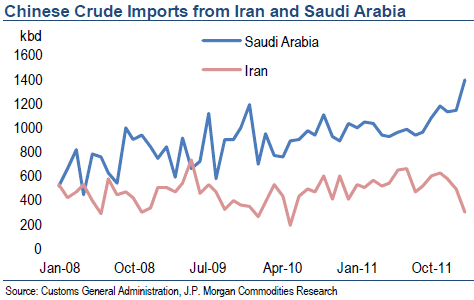 China is starting to pressure Iran by reducing oil purchases from that nation (substituting with Saudi oil). Iran sells 65% of its oil to Asian nations, with China taking a large portion of that. China has two reasons to reduce purchases from Iran. One is the obvious pressure from the West that could give the US a national security based reason to slap penalty tariffs on Chinese-made goods (or at least threaten to do so). The second reason is to force Iran to ultimately sell them crude at below market prices - which may make dealing with the US threats more worthwhile (for more on such strategy see this post). Other Asian nations have apparently joined in this effort as well. CNN: China, South Korea and Japan dramatically cut their oil imports from Iran in February following intense US efforts to persuade Asian buyers to comply with Washington sanctions on Iran's central bank. The next round of nuclear talks is likely to be held in April (with the so-called 5+1 group the US, Britain, France, Russia, China, and Germany). Iran's authorities are desperate to get this issue resolved while still saving face. Cut off from external capital, oil revenues dwindling, inflation running close to 25%, and food shortages becoming commonplace - all putting pressure on the government to ease the sanctions. The rhetoric out of Tehran will be escalating as the talks draw closer and the internal situation within Iran's borders becomes more dire. Tehran Times: It’s clear that the unilateral sanctions imposed on the Central Bank of Iran and other Iranian institutions and the call for a boycott of Iranian oil were the last cards that the West had left to play before the negotiations with Iran. In this situation, Iran has the upper hand in the nuclear talks and can put diplomatic pressure on the West. And if the upcoming nuclear negotiations fail, the big losers will be the Western camp not Iran.